I’ve been suffering a hiking drought for most of January and all of February. Last February I hiked South Moat, Potash and Kearsarge North on three different weekends, but due to some of the coldest and windiest weather in recent memory and other commitments I haven’t been able to get to the mountains. I’m growing stir-crazy to say the least. In order to keep the writing flowing I’ve decided to revisit some memorable hikes from the past. I got bit hard by the hiking bug in 2011. As the snow was finally melting in late May I headed up to Baxter State Park for my very first solo hike. My goal was to climb Baxter Peak, the Top of Maine, but when I got to Roaring Brook Campground and checked in with the ranger that didn’t seem possible. Snow was hanging around unusually late in the year and some of the trails were still closed. 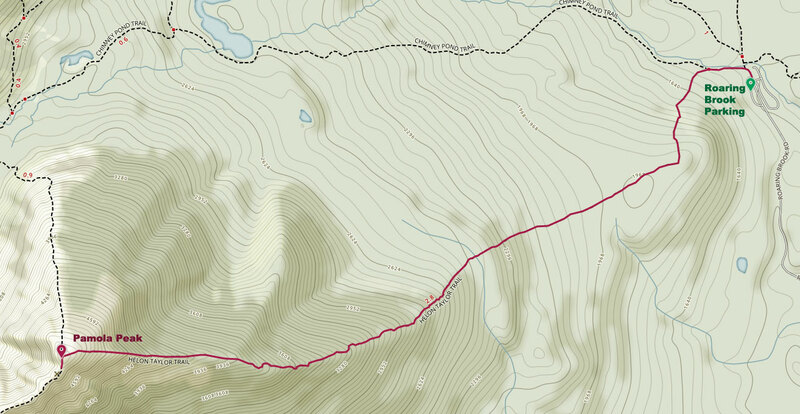 The only trail open to Baxter Peak from the eastern side of the mountain was Knife Edge and the ranger didn’t suggest hiking it alone or twice in one day, especially if it was my first time hiking it. I adjusted my plans to just target Pamola Peak (a worthy target at nearly 5000′), and headed to my campsite for the night. I got some firewood (always cheap and plentiful at Roaring Brook), cooked my dinner and had a few beers before turning in early. I was up and on the trail by dawn, slogging my way up the Helon Taylor trail. The trail was named for a former supervisor of Baxter State Park and is the epitome of Maine and Baxter State Park trails. Part of Percival Baxter’s wishes for the park was for it to “forever be kept and remain in the natural wild state.” Applied to its trails, I interpreted this as maintaining the most direct routes with the least amount of changes to the environment. There are no switchbacks (not a popular thing in the Northeast anyway), no man-made steps, no material like gravel carted in to make the trail more passable. Helon Taylor Trail is 3 miles of massive boulder hopping until you hit the talus cone near the summit. Though the trail is popular due to it being the starting point of Knife Edge, it is a worthy the hike on its own. 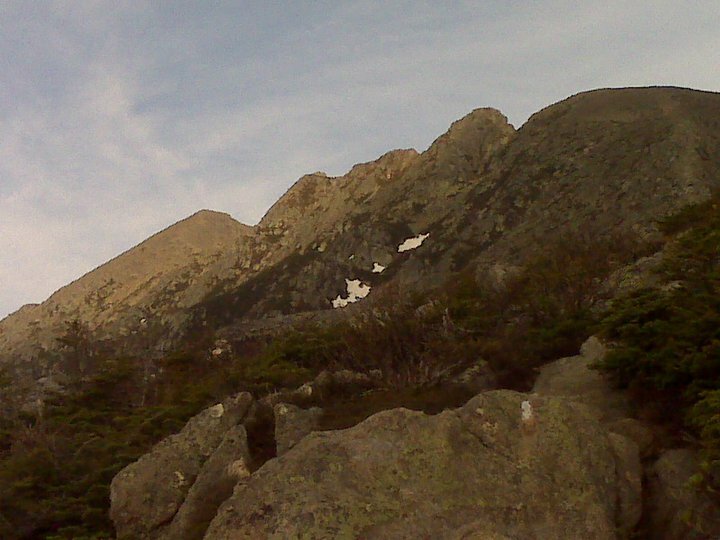 Once up on Keep Ridge it affords views toward Hamlin Peak to the north and the lower elevations to the south. Once I got to the top of Keep Ridge and approached the volcano-like cone of the summit I got my first view of Knife Edge. The ragged ridge stood out sharply against the sky. Looking back down the ridge to the west I got an amazing view of the distance I had come. I struggled up the last few hundred feet of the summit and found myself alone, with just the barren landscape and the sound of the wind for company. I sat down facing Baxter Peak to have a snack and was in complete awe of my surroundings. I had loved animals and the outdoors my entire life and I had long ago fallen in love with camping and hiking, but it was at that moment, alone with the Abenaki god of thunder and cold weather, that I fell in love with the power and enormity of nature and was at peace with the solitude I found. It’s a feeling I can’t shake, ingrained in my psyche, and it’s a feeling I try to replicate every time I head to the mountains. Once the frigid wind had cut through my layers and into my bones it was time for me to get moving. 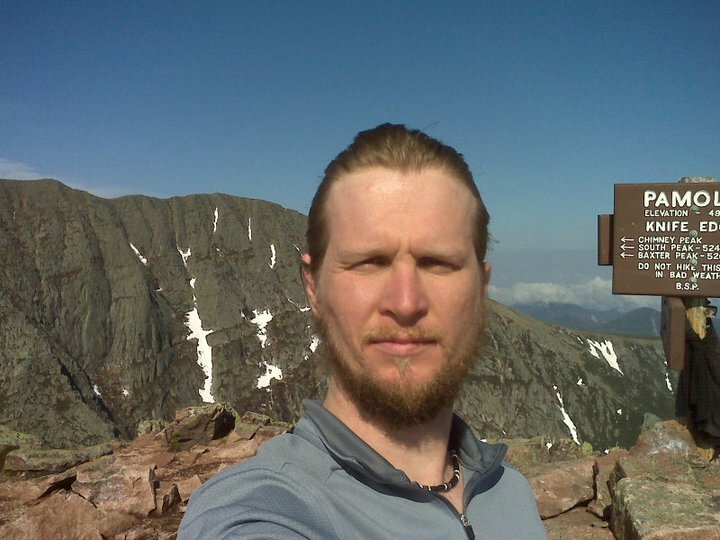 I didn’t want to leave without getting a closer look at Knife Edge, so I left my pack at the summit sign and hiked to the west to look down into The Notch and up to Chimney Peak. The Notch was such an intriguing feature, a big bite taken out of knife-like ridge, that I just had to climb down into it. From down in the notch I looked deeper into the chimney toward Chimney Pond and felt the constant wind funneling through that one exit point. Mount Katahdin is a C-shaped massif with the opening pointing to the north. 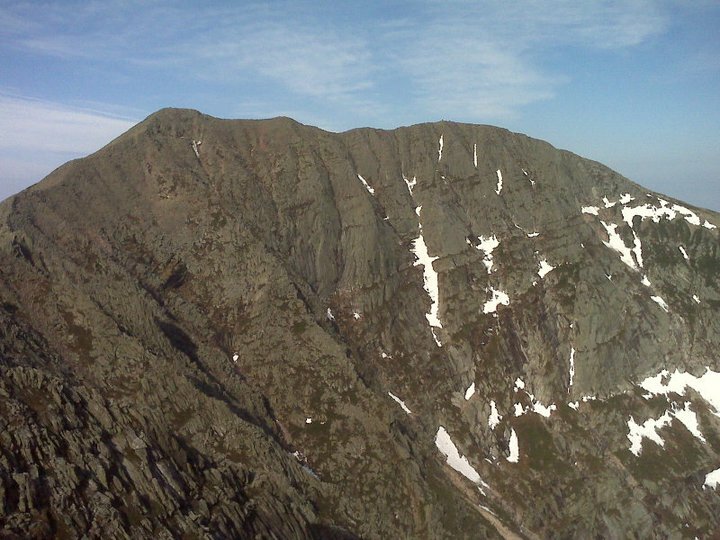 The Notch is a low point on its eastern side. I could see how the bite was taken out of the side of the mountain over the years, with its crumbs being spit down the mountains flank to the east or the west depending on the wind direction. Not wanting to fall too in love with Knife Edge and find myself trekking across it despite the ranger’s warning, I climbed back up to Pamola Peak, grabbed my pack and with once last fond look toward the regal Baxter Peak I made my way back down the mountain. It was still morning as the trail flattened out and I found myself approaching Roaring Brook Campground. 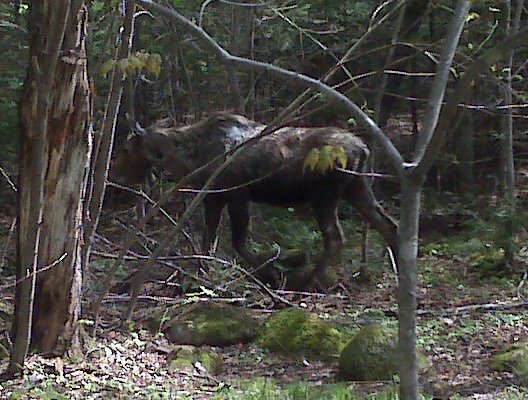 I finally passed another human and then as the ranger station came into sight so did a moose foraging for grub. I got into my car and started the four and a half hour drive back to Portland, but on that day I left a part of myself in the mountains. Since then I’ve been trying to reclaim it by wandering into the wilderness as often as possible. Man is born to die. His works are short-lived. Buildings crumble, monuments decay, and wealth vanishes, but Katahdin in all it’s glory forever shall remain the mountain of the people of Maine. “Baxter State Park Purpose.” baxterstateparkauthority.com. Baxter State Park Authority. Web. 1 March 2015. “Pamola, A Penobscot Legend.” native-languages.org. Native Languages of the Americas. Web. 1 March 2015. “Pamola Peak” peakbagger.com. Peakbagger.com. Web. 28 Month 2015. 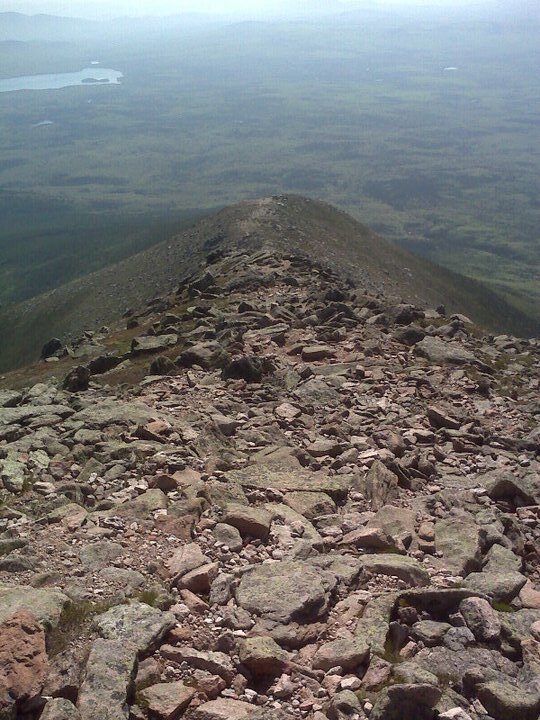 This entry was posted in Hike and tagged Baxter State Park, Knife Edge, Maine, Mount Katahdin, Pamola Peak, Roaring Brook Campground. Bookmark the permalink. Another beautiful and inspiring post, Cade. Thanks so much for sharing.